We love and respect trees. From the mightiest oak to the tiniest dogwood we love them all. Yes even the Sweetgums and Pines. Did you know that tree pruning increases the life expectancy of a tree and reduces the chances of branch and whole tree failure? Tree pruning is the most common tree maintenance procedure and can be extremely beneficial. Because it is so common its importance can be overlooked. In a forested environment trees grow nicely with only Mother nature’s pruning. But trees in urban environments like Raleigh require more care and attention. Periodic pruning and trimming is essential for these urban trees. Pruning is necessary to maintain structural integrity and improve aesthetics and must be done by an individual that understands the biology and physiology of a tree. Improper pruning procedures can create lasting damage and shorten the tree’s life expectancy. Each cut that is made has the potential to change the growth pattern of the tree and just a single mistake can ruin the entire tree. Arbormax tree service is dedicated to providing proper pruning. First and foremost we will always keep the trees health in mind. Prior to pruning, the arborist will examine the crown of the tree and identify which branches need to be removed. While pruning to meet the trees current needs we will also keep the trees future growth in mind. We understand how trees grow and what influences their growth patterns so we are able to redirect future growth the direction we want it to go. There are many reasons for pruning trees. We prune for safety, we prune for aesthetics we prune trees to increase clearance. Whatever the function or reason Arbormax tree service is the best choice for pruning and trimming in the Raleigh area. Raising and elevating is the most common type of pruning that we are asked to perform. This type of pruning typically removes the lower branches from a tree to provide clearance for buildings, vehicles and pedestrians. It also includes reducing the spread of a tree to provide additional lateral clearance to buildings. Cleaning is the general process for pruning and trimming trees. It is the removal of dead, dying, diseased, crossing, poorly attached, and unhealthy branches from the crown of a tree. Thinning is the process of selectively removing branches to improve the structure of a tree and to increase light penetration and air movement through the crown. Proper thinning opens the foliage of a tree, reduces weight on heavy limbs, and helps retain the tree’s natural shape. Thinning should be concentrated on the outer portions of the canopy, leaving as many branches on the interior crown as possible. Reduction reduces the size of a tree, often for utility line clearance. 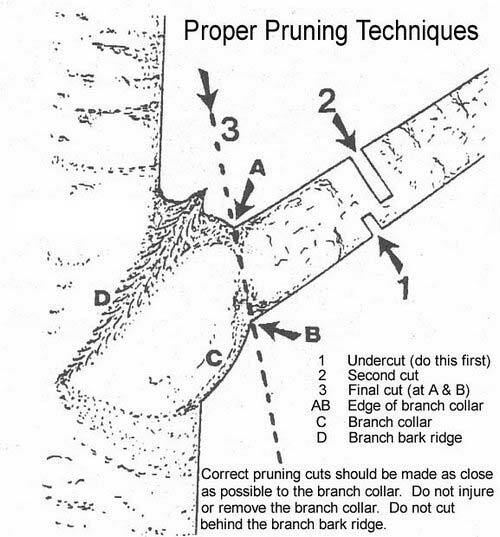 Reducing a tree’s height or spread is best accomplished by pruning back the leaders and branch terminals to secondary branches that are large enough to assume the terminal roles (at least one-third the diameter of the cut stem). Compared to topping, reduction helps maintain the form and structural integrity of the tree. This is the most common approach to pruning Bradford pear trees. Pruning Guidelines we abide by. We do not use Climbing spikes when pruning trees. This will unnecessarily puncture that vascular system of the tree and possibly compromise its health. We never remove more than 20% of a mature trees crown. Mature trees will not react well to excessive pruning and may go into shock. It is not a good idea to remove limbs larger than 5 inches in diameter. The wounds will have difficulty healing over and will lead to rot in the parent stem. We welcome the opportunity to visit with you and your trees for an assessment of your current pruning and trimming needs. We provide Pruning and Trimming service to Raleigh, Cary, Durham, Apex, Holly Springs, Chapel Hill and the surrounding areas.